Two weeks ago, I posted some thoughts on raising kids in cities and right away, the comments section and Twitter lit up with a fruitful discussion of urban and car-lite parenting. The staff at Streetsblog and our partners at the Alliance for Biking & Walking love to see kids riding red wagons to day care, splashing in the fountain at the neighborhood park, and enjoying traffic-free play time in the street. Raising kids in cities is good for the kids and good for cities. Streetsblog and the Alliance are jointly sponsoring a back-to-school photo contest. We want to see what “crawlable urbanism” looks like where you live. Send us your photos of car-free kiddie transport and street life for the under-12 set and you could win fabulous prizes (see below)! To enter: Email your pictures as a JPG or PNG file to photocontest@peoplepoweredmovement.org, with the subject line “Kids + Cities Photo Contest.” Photos should be high-resolution (at least 1,600 pixels wide or tall, if a vertical image), without watermarks. Please submit no more than 10 photos for this contest. In the body of the email, provide your name, address, telephone number, email address, and photo caption. Please submit your images in as few emails as possible. Deadline: Friday, September 20 at 5:00 p.m Eastern time. Streetsblog and Alliance staff will pick 10 finalists and post them for our readers to choose the winners. Permission: Taking pictures of people — even children — in a public place is legal and does not require permission. That said, we encourage you to ask permission as a courtesy when taking pictures of other people’s kids. Rules: Employees (and family members of employees) of the Alliance for Biking & Walking, Streetsblog, and our parent organization, OpenPlans, aren’t eligible for this contest. Your submission constitutes your guarantee that the photograph is an original work created by you alone. Normal photo editing is fine, but please, no photo-shopping that alters the content of the photo. Only pictures taken in the United States are eligible to win. By submitting photos to this contest, you are authorizing the Alliance for Biking & Walking to place your photo into the Alliance’s online Flickr photo library for use by the Alliance, Streetsblog, and Alliance member organizations for charitable purposes related to bike and pedestrian advocacy. Prizes: Two stylish and fun Breezer Downtown EX bikes! These are great! Thanks, Steve! 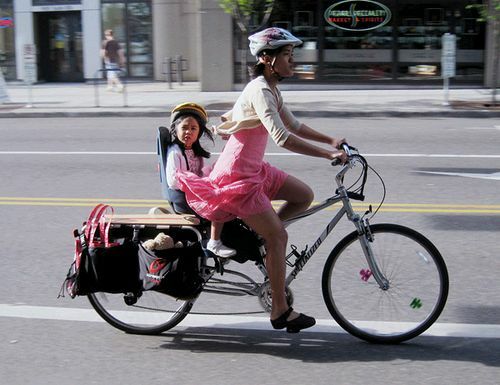 That is one fabulous cargo bike. I have a Q. What do people do about helmets for their kids? The helmets just flat out don’t fit, at all, but if you dare let your child out of the house without one the other parents will call the FBI on you. Just everybody just put an ill-fitting tupperware on their child’s head (like in this photo)?